Foreign buyers are often shocked by the behavior of their Chinese suppliers. They are themselves often trying to grow their business by making unprofitable deals with new customers. And when they ask for some help from their supplier, they can’t even extract a few cents off the price, or get a claim settled. 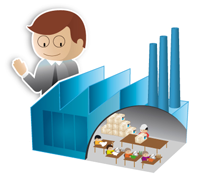 They cannot convince their suppliers that making small efforts can lead to long-term benefits. Why are Chinese people so focused on short-term results? Many people invoke the unstable business environment and the very fast changes that occured over the last 30 years. Long-term planning has indeed been close to impossible. New markets opened up suddenly, and new competition with rock-bottom prices emerged even faster. Similarly, foreign buyers can’t be counted on to keep placing orders with the same supplier. The government also has its share of responsibility: activities that are tolerated today might be considered illegal tomorrow. The legal system leaves many grey areas, subject to the officials’ judgment. One can also feel that the Chinese see a window of opportunity that might be open for them now (and it might be closing with the current economic crisis). So they think they have to take their chances and make profit NOW. In China, taking inconsiderate risks and ending up in debt is a disaster for the whole family. Creditors will chase the relatives until everything is paid off. There is no personal protection from business debts. And no money means no health care, too. So the Chinese tend to save large portions of their income. Is there are more profound, cultural reason? Farmers were so good at finding small ways to increase efficiency through tinkering and that success with short fixes dulled the impetus to build machines that could replace human labor. What is surprising is how little has changed, even as the country has moved from agriculture to a focus in export manufacturing.Factory owners were just as focused on life at the margin. While they worried less about natural disasters, they behaved as though they were struggling to just get through the season. What is the consequence of this short-term orientation? The typical Chinese businessperson is far more protective of his or her cash and far less protective of his or her business than an American businessperson. American businesspeople frequently put their cash into their businesses to keep it going, whereas Chinese businesspeople seem not to. The Chinese are much more comfortable with tangible assets such as cash and real estate properties, than with a healthy business. They usually don’t plan to pass the business on to their children — the most important is to make sure they will never need money. What are the takeaways for importers? Understand the short-term motivations of your suppliers; there is no use in promising long-term sucess. Your supplier will never accept to lose money on an order; if that’s what they pretend, it might well be bluff. Always allow at least a small margin on your orders, or the factory will look for a way to reduce its costs and might create a disaster. Long-term business relationships are not the rule here. Always develop samples with several suppliers and keep a back-up solution.